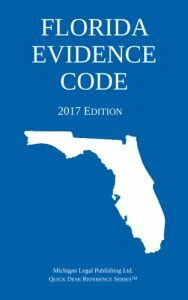 2017 Florida Evidence Code - Michigan Legal Publishing Ltd.
A handy pocket version of the Florida Evidence Code (5″ x 8″), as amended through January 1, 2017. A Perfect quick reference for your desk or briefcase, for both attorneys and law school students. © 2014-2019 Michigan Legal Publishing Ltd.